As an entrepreneur, one of the best tools in your tool box is your intuition. While analytics and data are the best foundation for decision making, they are sadly not available in every situation. If you can tap into your gut instinct when faced with issues like potential new hires to investments, it will save you time, money and grief for years to come. Drew Sanocki joins me to talk about our experiences with making decisions based on our intuition, as well as both of the instances where we got it right and wrong. Find out why you need to pay attention to the little things, get outside perspective and take your time before jumping into any significant decisions. With our help, you can learn to use your intuition and decision making in tandem to make judgement calls that will help you reach your long and short-term goals with ease. Andrew: Hey guys, quick note before the show starts. If you’ve been listening the last couple of weeks, you know that October 7th through the 9th in Nashville is our annual Ecommerce Fuel live event for private form members now open to non-form members who have a store that does at least $100k in sales or worked for one or that are industry professionals. If you’re interested in joining us, we’d love to have you. You can learn, see a video from last year and sign up if there’s tickets left at live.ecommercefuel.com. All right, let’s get on with the show. Welcome to the eCommerce Fuel podcast, the show dedicated to helping six and seven figure store owners build amazing companies, outgun the competition and make more money. I’m your host and fellow Ecommerce entrepreneur, Andrew Youderian. Hey guys, it’s Andrew here and welcome to the Ecommerce Fuel podcast. Thank you so much for joining us on the show today. Today I’ll talk about something a little bit more abstract: how do you make gut level decisions? A lot of times, you’ve got a lot of data decisions, fairly straight forward or you know the outcomes or at least you know what’s at stake. Sometimes or even more often than not, they’re not as cut and clear and you have a lot of intangibles to work from – how do you make those? How do you grapple with those? Is there any kind of framework or rules you can keep in mind when you’ve got those? And joining me to talk about the issue, the man behind drewsanocki.com and the newly launched podcast over ecomdojo, that’s with one m, e-c-o-m-d-o-j-o.com. Drew Sanocki, Drew – how are you doing, man? Drew: Good and we also got ecomm with two m’s. Andrew: Oh you did? Either or. Drew: Listener feedback, yeah, so it’s going to redirect so you can type in two m’s if you want. Andrew: Either or. Yeah, I was trying to find it when you told me. It took me like five minutes so it was probably a good call. We were talking before we came on the podcast here how we can talk about gut level decisions from a business standpoint but might be more fun to do this from a relationship standpoint, as you were saying, that’s where you have most of your experience. Drew: Half the stuff I talked about before I got married was deciding whether you should keep dating somebody so and how to decide that so that was the big gut level decision. Andrew: It is! We were joking about doing the love line call for an episode and having people call in with their personal issues, very tangentially related to Ecommerce and how. . .maybe we’ll do that. We will have to an episode like that. It would be a lot of fun. Drew: And I think with this podcast, we’ve got to just go with our gut, like wherever it takes us. Andrew: Just start making. . .
Drew: I’m just going to answer without thinking. Andrew: It’s on the docket. We’re going to have to do it. Drew: Closing my notes now. Andrew: All right, let’s get into it for real. How to make gut level decisions better. So Drew, I think both you and I will agree that making data driven decisions if you can is always of course preferred but unfortunately, it’s not always possible. Sometimes you’ve got subjective decisions. Often you’ve got subjective decisions you’ve got to make in business. Who do you hire? When to invest you money when you don’t have clear ROID? It’s one thing to say, hey, we’ve got a very profitable ad words campaign. Let’s dump more money in there. That’s an easy one. It’s much harder when you don’t have a track record for a given advertising platform or multiple one’s you’re considering. Where do you put money in there? What business lines to pursue in your existing business or new ones? So a lot of these – what do you think? What percentage of decision do you think are gut level versus having some pretty clear data? Drew: I would say it’s something like 99% are gut level decisions. If it’s just like life decisions day to day, so much goes on on auto pilot, you’re deciding what to eat for breakfast every morning without data, just I think and the same thing happens at work because the gut levels decisions for the most part are your inner personal relationships decisions too and so those are just constant. Andrew: Yeah, I would say almost all of them are and I feel there’s a good number of business ones too are just gut level. You’ve to make, maybe you’re leaning in one way or another but ultimately, there’s no clear outcome and you just gotta pick one and go with it, which is tough. So some thoughts on how to maybe make these decisions with hopefully a little bit better clarity. But don’t trust us, these are all gut level answers so I’m not sure how much credence you should be putting into these but the first one is: never talk yourself into people. So, Drew, it would be interesting to get your take on this but for me, I put a ton of weight onto first impressions. For me, those are really important and little things for me in interactions with people, aren’t little. They’re big things. I feel like you can really extrapolate a lot out of somebody, even based on a five minute conversation, sometimes even based on a 90 second interaction and not always. There’s definitely been times I’ve been wrong about people but more often than not, I feel like I’ve been right and there’s been times in my business career and personal even where I’ve turned down fairly lucrative opportunities just based on a bad gut feeling about somebody that I didn’t want to be in bed with them in terms of business. I don’t know – do you feel the same way? Drew: Yeah, yeah we’ve had that a lot at my business where somebody looks good on paper and they may be a great fit for the position. They can do it one handed and you hire that person but at the very onset, you had a bad gut level decision, a bad sort of intuition about that person, something about them rubbed you the wrong way and low and behold, you were right. After months of working with that person, you realize it’s just not going to work for one reason or the next so I’ve gotten better at trusting my gut there because I think in the past, I would have just gone with the weight of the evidence. Andrew: Yeah, it’s so easy sometimes to, I think it’s our nature maybe to explain things for people. So maybe somebody isn’t quite as detail oriented as they should be and they say, “Oh, they were busy this time,” or “this happened.” The other thing it’s easy to do that, to try and explain things away but I think more often than not, the way people handle little things is how they’re going to handle, larger, bigger, more complicated, more complex things so. . .
Drew: Yeah, trust your gut on people, I think. It’s an important one. Andrew: Number two: gage your excitement factor. I think there’s definitely a time and place for doing things that you’re not excited about doing. Like for me, for example, getting started with red channel radios right out of the gates. I wasn’t super stoked about CB radios. My primary goal was to build a profitable business and I’m very glad that even though that wasn’t something I was passionate about, I still plugged ahead and made it happen so there’s a time and place for that. I think all things equal, if you’re looking especially at multiple options, if you’re not excited about something, I think you need to think really long and hard about doing it because it’s more often than not, it’s going to be what gets you through a lot of the hard parts, the trying parts and so, two opportunities equal to one you’re a little more excited, is probably going to be, maybe it’s common sense but even, I would rather take an opportunity I was really excited about that might be a little less lucrative as opposed to one that maybe had a little more financial upside but I just dreaded doing the work. Drew: Yeah, I agree. I think you’ve got to look a little long term and realize if it’s something that’s going to repeat itself, like if there’s just this project that you can’t get excited about and yet it’s crucial to your business, are you realistically going to get up every morning maybe next week or a month or two or three, especially if it’s a long duration project, what’s going to keep you working on that? And maybe in that case, you avoid it. You avoid that project or even better, maybe you could find somebody else to take on that project who’s a little more excited about it if it’s still sort of critical for the business. Andrew: Yeah, and even apart from an excitement factor, let’s say you’re looking at picking a new advertising channel for your business and you’ve got three or four options. And you look at the data, you look at case studies. You’ve done as much research as you can from that standpoint but for whatever reason, one of those you just feel it’s a better fit. You feel it’s maybe not as large but it’s just a bitter fit for your audience or whatever it is, something intangible there that’s making you lean there. I think listening to that voice, even if you can’t put an exact finger on it often is the best way to go. Andrew: Number three: get outside perspectives from people. So enormously helpful as business owners, as entrepreneurs. We’re so close to our businesses, it’s really difficult sometimes to see the forrest for the trees. And I think having a confidante, whether it’s a spouse – for me, it’s Annie, a family member, a business partner, someone that you can speak 100% candidly about on any issue. The things that you’d never say to other people because you’d sound terrible or judgmental or whatever it is. You can be completely transparent with them. Having someone like that that not only you can be open with but you can bounce these ideas and these decisions off is just so enormously helpful. There’s been so many times I’ve gone to Annie with things where she’s really helped me think through things in ways I wouldn’t have if it was just me sitting in a room looking at a wall. Drew: I think it’s also important when you have that confidante to listen to how you’re describing an opportunity to them because I’ve found with my wife, if I am just really not that excited about doing something and my intuition might tell me it’s a bad idea but, again, on paper it might be a big opportunity and I’m describing it to my wife and I’m almost giving excuses to why I should do this or why we should do it. She will see right through that and say, “You’re kind of – you sound like you’re trying to convince me.” She’s like, “I get it but are you really on board with that?” And if you listen to yourself and if you listen to the language you use and sort of how you feel, you’re like, “You’re right. I’m trying to convince you and if it were really an idea I was excited about, I wouldn’t need to convince you of this.” I think listening to how you talk to your confidante is also sort of very insightful. Andrew: Yeah, great point! And on the flip side as well, if you’re really really excited about something and just bubbling over with enthusiasm, and whoever that is, your spouse maybe comes to you and says or he says, “I see what you’re saying. I can see why you’re so excited but have you thought about a,b, and c. I feel like these might be potential problems.” I think I know my gut reaction is to try to explain them away and be like, “You don’t understand.” You get a little bit defensive and I think you get defensive, that’s a huge red flag. You need to think through, why am I getting defensive? Usually it’s because it’s because valid points are being raised and you are bummed out because it’s getting in the way of what you see as a perfect opportunity. Andrew: Number four: give it time. I’ve found that the bigger the decision, the more time I try to allocate to it and a lot of times, you just need that time to kind of let it sit and digest and really think through the implications of something so don’t decide to uproot your family over night and send them across the country. Always, always, even if it’s a job opportunity, always ask for at least 48-24 minimum 48 hours. For bigger things, if you’re thinking about buying a company, selling a company, hiring someone, give it time. That time really can help you think through things that otherwise you wouldn’t in a shorter period. Drew: Yeah, that sleep test, I’ll think about it tomorrow morning is really really helpful. I find if you look at my Go Daddy account, it’s like a boulevard of broken dreams for business ideas and some of those are so dumb I was just into them at the time so thinking about it for a couple days before you make a decision definitely helps temper that enthusiasm. Drew: Yeah, yeah. I think a lot of entrepreneurs could relate to that. Andrew: Number five: look at your long term goals. And this may sound obvious but is what you’re thinking to do going to make those goals easier or harder to achieve? Sometimes something in the short room looks really attractive but it’s taken us down a different path but looking through the filter of your long term goals of where you’re headed, can bring a lot of clarity to some of these tougher decisions that really aren’t cut and dry. And if you don’t know what your long term goals are, write those down. It’s so helpful, I think, to have those on paper, to look at those on a weekly basis. It can really help you make these decisions, not only getting you day to day, but with these bigger one’s, it’s tremendously helpful. Drew: Yeah, it gets the focus too, right? You only have time to do a certain number of things and if you go with your gut too much and take on too many bright, shiny objects or bright, shiny opportunities, you don’t focus on accomplishing bigger goals. Andrew: Yeah, a couple books I’m reading right now, one of the books is called “The One Thing,” and the other one’s called “Essentialism.” And they both, slightly different spins on the same concept of – have you heard of these books, Drew? Andrew: Okay, great! Yeah, so you know exactly. Both of them focus on just cutting really understanding where your leverage points are but more than anything, focusing on one thing because that’s where you can make the biggest difference and where you can actually get stuff down. So they’ve challenged me a lot these past couple of weeks to really think through what is it you want to be, what’s the one thing you really want to be good at and focusing your time and energies there. And that’s a hard question to answer so but yeah, if you’re struggling with focus, like most entrepreneurs do, they’re both exceptional. We’ll link up to both of those in the show notes. And then finally, number six here is just, again, this kind of goes with in line with the topic of the episode here but trust your gut. We’re talking about making these gut level decisions and I think, again, don’t want to do it for everything but if you’ve got an inclination on something, don’t talk yourself out of it. 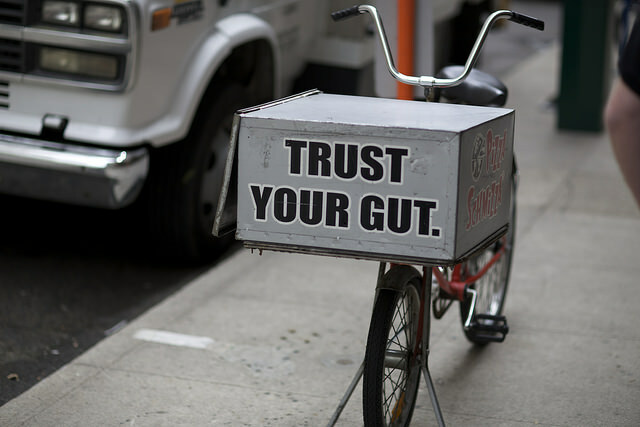 On my personal mission statement, the ways I try to work, one of the things that’s on there is trust your gut. Don’t go against that. Another thing you can do too if you’re not sure what your gut is telling you is do the flip a coin test. I don’t know if you’ve heard of this, Drew but say, hey, heads I’ll do a and tails I’ll do b. You flip the coin, you see what comes up and you figure out if you feel disappointed based on of the other outcomes and if you can do that, a lot of times you can maybe figure out what you’re subconsciously thinking when you’re really having a hard time trying to come up with an answer. Drew: Yeah, that one works really well. I use that one myself. Andrew: Is that how you decided to start Design Public, the coin test? Drew: No, no. It’s how I decided to get married. Andrew: Oh, nice! Even better. Sarah, congratulations! I’m so glad it was heads. Awesome, Drew – any parting thoughts on this? This is kind of a shortie and quickie but it’s one we’re dealing with on a daily basis. Drew: No parting thoughts, just I don’t know what the lesson is. I don’t know if it’s trust your gut or build up enough framework around your decision making to resist trusting your gut. I don’t know what the big takeaway is. Andrew: Yeah, I think some of the takeaways are if you’re trying to talk yourself into doing things or people, don’t do that. If you don’t have a confidante, takeaways for those action items, if you don’t have someone you can really be truly honest and transparent with, get somebody that can get help you with that. Find that sounding board, that confidante and if you don’t have long term goals as well to be able to measure some of these decisions against, that’s another priority to sit down with today and write those out. It’s amazing how a lot of times when you ask people, “Where do you want to be in five years with your business and professionally?” A lot of people don’t know. And if you don’t know where you’re going, how do you evaluate decisions based on where you want to get to, right? So I think those are going to be the big takeaways from this episode. Drew: Yeah, trusting your gut can be really valuable but put some of these other systems and processes in place so that you give it context and can make it even better. Andrew: Yeah, Drew – it’s been a lot of fun. Thanks as always. Again, if you’re not familiar with Drew’s work, drewsanocki.com. Fantastic long form stuff and also ecomdojo.com with an m or two m’s, your choice. And that’s a podcast Drew just started with his brother that really for makers, people who are making their own products for the Ecommerce space so check him out over there. Drew, it’s been fun as always, man. Drew: Yeah, thanks a lot! Andrew: That’s going to do it for this week. If you enjoyed the episode, make sure to check out the eCommerce Fuel private forum, a vetted community exclusively for six and seven figure store owners. With over 600 experienced members and thousands of monthly comments, it’s the best place to connect with and learn from other successful store owners to help you grow your business. To learn more and apply, visit ecommercefuel.com/forum. Thanks so much for listening and I’m looking forward to seeing you again next Friday.